Installing a custom T-top on your boat or selecting it as a factory-installed option can cost $3,500 or more, but some companies offer aftermarket tops that are more affordable. 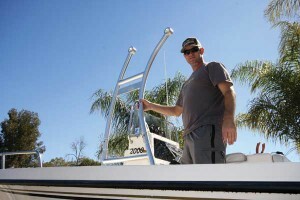 Stryker, for example, offers two universal models that fit a wide range of boats and are priced as low as $899 for the SG300. Installing a T-top is at least a two-man job … three if you can afford the pizza and beer for the helpers when the job is done. Here are the tools you will need: a caulk gun, a 3/8-inch and 3/16-inch Allen wrench, an electric drill with a 0.15-inch bit and countersink bit. The cost will depend on the model. Stryker’s SG600 fold-down model is $1,299. Add an optional electronics box for $329 and rocket launcher rod holders for $299, and the total cost climbs to $1,927. Step 1: Since you will be drilling holes into your deck, you’ll first want to contact the manufacturer to find out where the fuel tank is located. Stryker T-tops mount on the sides of the center console, so clean the area with acetone, and tape this area of the deck where you will place the feet of the T-top with 3M 2090 outdoor masking tape. Step 2: Join the upper and lower side rails together on land, then bring them aboard to determine the best mounting location. Most center consoles have an access door for the storage/head compartment, so work on that side of the console first to make sure your installation doesn’t render the door unusable. After finding the ideal location, mark the screw holes and trace an outline around the support bases with a Sharpie. Then measure the distance from the rear of the base to the bottom of the stern and also to the side of the cockpit, and write the measurements on the blue masking tape. Use these measurements to determine the side-rail placement on the other side of the console. 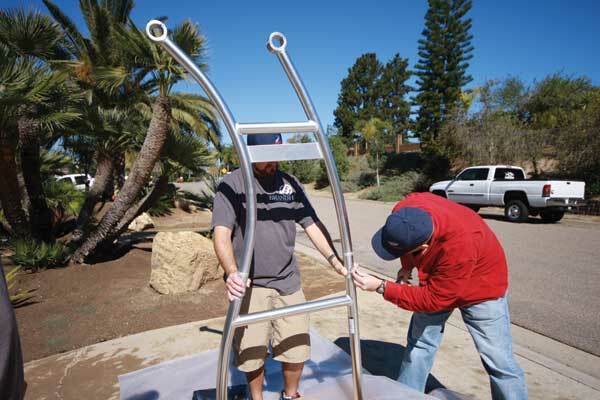 With the side rails in place where you will install them, measure the distance between the rear bases to help you position the top frame correctly. 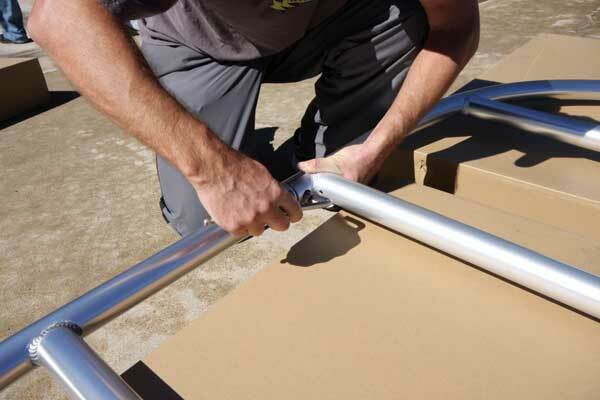 Step 3: The install kit comes with “stand-offs,” or spacers, that affix the frame to the side of the console to give it greater stability. The spacers can be cut to fit later, but you want them to be from 1 to 7 inches long and use at least one per side. Lay a T-square on the cross-member to help you locate the proper place to drill. Make a mark on the console and on the pipe in the desired location. Since the pipes are 2 inches in diameter, drop the console mark 1 inch and it will be where the middle of the pipe is located. Drill holes in the console and the pipe. 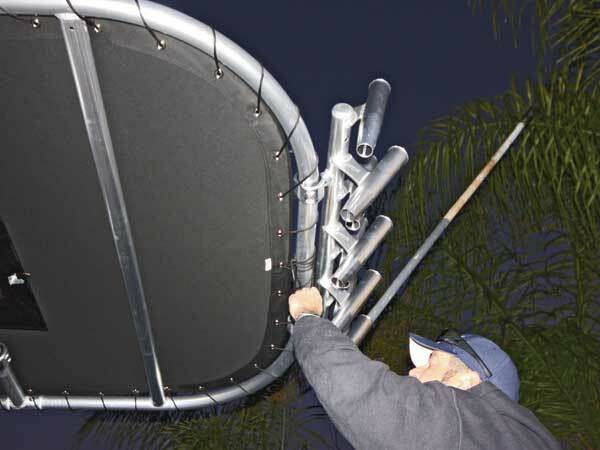 The stand-off will be installed after the T-top is affixed to the deck. 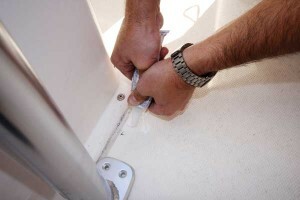 Step 4: The enclosed directions instruct you to assemble the top to the sides on land, which is the preferred technique for a boat in the water. But our boat was on a trailer, so we opted to assemble everything on board, because lifting the assembled T-top onto the boat would have been cumbersome. Since Stryker T-tops have clamps at the top of the side rails to hold the top, they can be used on a wide range of boats with different-width consoles. These clamshell clamps have pivoting hinges that tend to flop closed prematurely, so until you’re ready to bolt them down, tape them open with the blue tape until the top section is put into place. Position the side support bases in their outline on the blue tape and lift the top into position. When everything looks even, take the tape off the hinges, squirt Loctite onto the bolts and tighten them in place (use LanoCote on bolts for the fold-down hinge). Step 5: Now it’s time to drill some holes into the deck. With the tape still in place and the T-top unit properly positioned, use a small drill bit to drill some pilot holes. Make sure you are drilling straight down and go about 2 inches deep. Once all the pilot holes are drilled, move the T-top forward, away from the holes, and remove the tape. Use a countersink drill bit to chamfer the opening to make sure the fiberglass doesn’t crack when you drill it with the larger bit or insert the screws. 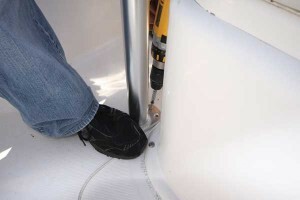 Drill the main holes with a 0.15-inch drill bit, and brush away any loose fiberglass. Step 6: Reposition the T-top bases over the holes you drilled and have one person put his foot behind the rear base to prevent it from sliding, and tilt the front end up in the air. The other person should make an X-shaped pattern of marine-grade 3M 5200 caulk from one hole to the other, using a generous amount to help form a seal to keep water out. Do this on both front locations, have the person holding the top lower it until the base is an inch or so above the deck, and then have the person who did the caulking insert the screws partially in place, screwing them in only an inch. The person holding up the top should then switch ends and tilt up the rear, taking care not to rip the already-placed screws out of their holes. 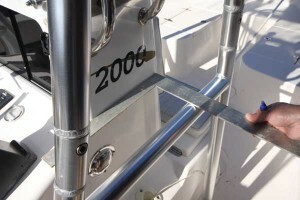 The caulker should repeat the X-pattern and insert the rear bases’ screws, and then the holder should lower the top, and all of the screws need to be tightened down. 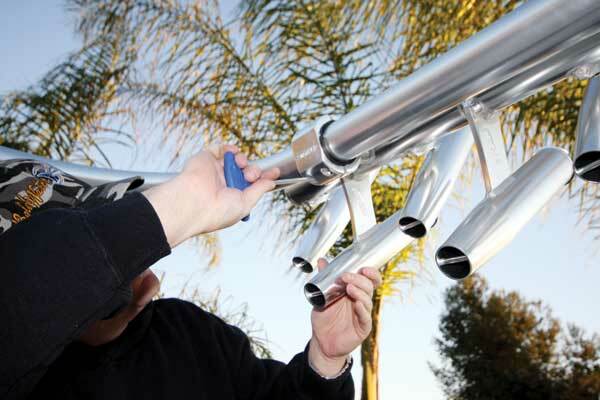 Clean up any excess caulk with acetone. Step 7: Connect the stand-offs to the sides of the console, and prepare to lace the Sunbrella canvas in place by attaching small tie-wraps to temporarily hold it in place. Lace it using the pattern shown in the directions, and then cut the tie-wraps. 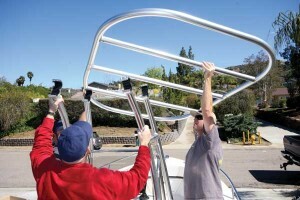 The rod holders attach to the rear rail with the same clamshell clamps as the top. Question 1- I did not want to use 5200 caulk because I may want to remove the Tee Top later and do not want to damage the floor.. Called factory and they said it was ok to use a good marine caulk. Just making sure this will be ok. Question 2- Still a little vague on installing the stand-offs. The video not shown here did not show installing stand-offs. See model above. Not exactlysure how the stand-offs will affix to frame and console. Hi. You have to find the best area at the middle horizontal tubes on the towers. Find the best place, measure carefully and drill through the horizontal tubing and through the console…and cut the standoff to fit. I’m putting my S600 up this week. Oh, and the 3M 4200 is the removable version of the 5200.